Hey, what are the FBI and the Orlando police trying to hide from the public in connection with the massacre at Pulse nightclub last month? The police’s slow response to the Pulse shootings (it took the police over three hours to rescue the remaining hostages that night)? 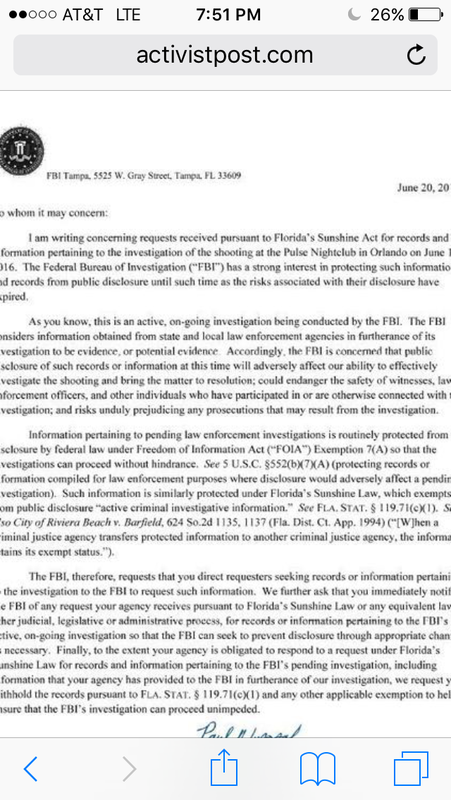 Under Florida sunshine laws, 911 phone calls are public records and must be released to the public, yet Orlando police–apparently at the request of the FBI (see letter below the fold)–is still refusing to release all but one of the transcripts of the 911 phone calls made during the Pulse shootings last month, and even the one phone record that was released was originally censored, with all references to Allah and the Islamic State redacted. Isn’t this sorry episode yet another textbook example of the police acting above the law? This entry was posted in Bayesian Reasoning, Current Affairs, Deception, Law, Politics. Bookmark the permalink. Just as the executive branch of Federal government is given “space” to enforce the laws, so I think this concept has extended to law enforcement (police and FBI) with respect to how much information is shared in an “on-going situation”. I don’t recall the Supremes weighing in on this, but if they have, my mistake. What I find appalling is that law enforcement agencies get to disregard State law, forcing the news media to go to the courts to petition for the release of the information, but the judicial process is notoriously slow and costly and the outcome of litigation can often be uncertain. I wonder who would have standing to elevate this to S.C.? Good question. The Orlando Sentinel (a local paper) and the news org Associated Press are currently fighting for the release of these public records in court, and I would think that they both should have standing to litigate this issue, but at the same time, the leading cases on the standing doctrine are often confusing and inconsistent, so who knows?